Authored by Sebastián Barschkis (sebbas) on Oct 29 2018, 5:05 PM. "Love" token, awarded by ofuscado. With Mantaflow the current smoke modifier UI will accommodate both smoke and liquids. In addition, there is now an option for Mantaflow liquids in the quick effects section ("Quick Liquid"). 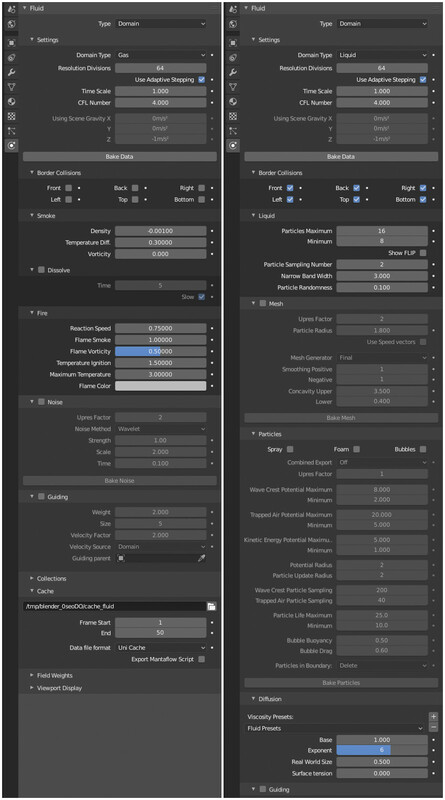 UI improvement for particle settings and path field in fluid domain settings. Hi @Sebastián Barschkis (sebbas)! Is there a particular design you'd like for @William Reynish (billreynish) and I to review or give feedback? With the new single-column layout and sub-panels it should be much easier to organize. I don't have a lot of experience with MantaFlow but if you could share some screenshots we can give you feedback. Hi @Pablo Vazquez (pablovazquez)! Yes, right, I've made use of the single column layout for the new Mantaflow options too. It looks all good except for one part where I am not sure: The check boxes for domain borders. Right now, there is no indication that "Front", "Left", etc. actually refer to "Front Border", "Left Border", etc. One could have added "Border" to all of the checkbox texts ... but I felt it would clutter the UI too much. @Sebastián Barschkis (sebbas): In the example you posted, a sub-panel could be useful. You could call it 'Borders Collisions' and put the checkboxes inside. Simple. Update manta files after merge with master. Harbormaster completed remote builds in B3293: Diff 14644. Think it's a solid solution. Was just wondering though if it is possible to define the placement of a sub-panel in the parent panel. Or do they always sit at the bottom? I find it a bit hard to test this given that this seems to be split over several different patches. But I think the UI layouts of the properties is not likely to be an issue, unless you are doing something very weird or out of the ordinary - and we can easily move things around a bit if needed, post-merge. @Sebastián Barschkis (sebbas) Maybe I could get you to post just an image which includes all the panels? Again, it seems very unlikely that there will be something in the UI that would be blocking in terms of a merge. Yep, I agree. Picture of the whole UI is definitely helpful too, will post one. To see all the diffs in action you can build the "fluid-mantaflow" branch. It has all the diffs in it. 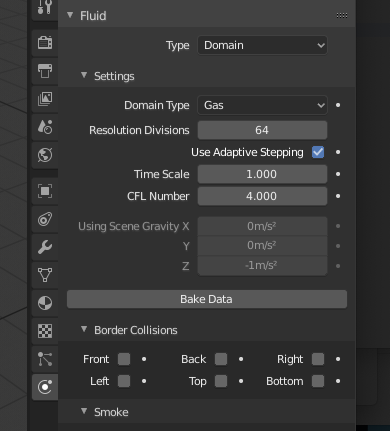 One UI feature that would be "new to Blender in this extent" are the Bake buttons. I guess they should be fine but maybe this is one last thing to confirm. And here is the UI overview (domain settings only). The left is for smoke, the right for liquids. Again, nothing too crazy. It's mostly fields for factors. I would say that looks fine. Probably we should put the Viscosity Preset in the header like we do for other presets now, but other than that I see no real issues - nothing blocking anyway. @LazyDodo (LazyDodo) At this point branch "fluid-mantaflow" is 100% the same as these diffs, i.e. after updating the diffs I merged everything back into fluid-mantaflow (which still had been on 2.79). So yes, to see everything in action "fluid-mantaflow" will be helpful.